Womens pair of straight tie clog overshoes stitched in the channel with needlepoint toes, 1 lift heel and brown seat rand. Overshoes consist of petrel blue, silver and red silk brocade uppers featuring square ended latchets to tie over shoes, laces are missing, and red kid cover to wedge. Latchets lined with brown leather and the remains of fawn brown felt. The black insole is mostly worn away. Heel socket is made for a broad heel. Overshoes for H4448-85, buckle shoes. These clog overshoes were made in England in around 1740-1749, to match H4448-85. The overshoes are a poor fit with the matching shoes. Cutting of the side guards suggests the clogs were worn with a similar styled pair of shoes which also did not fit. 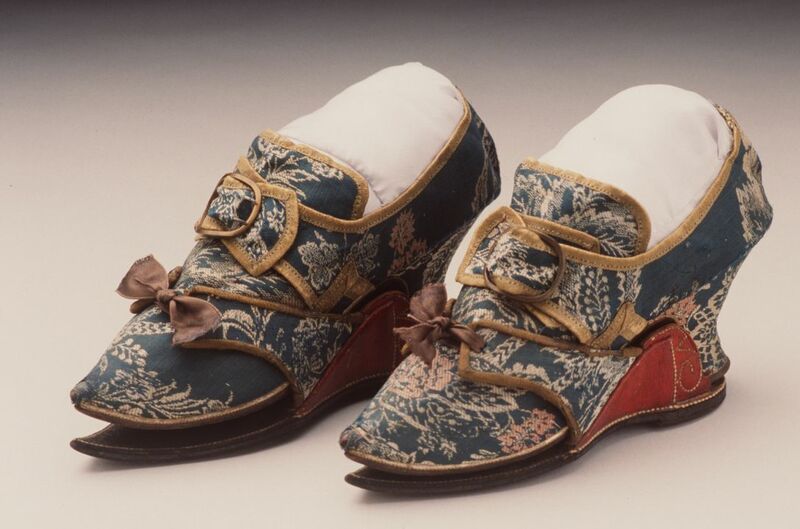 This pair of silk brocade clog overshoes made in around 1740-1749 is part of the Museum's significant Joseph Box collection. Joseph Box Ltd had its origins in a London shoemaking business established in 1808 by a 'ladies shoemaker' called James Sly. From 1816 Sly's apprentice was Robert Dixon Box, the fifteen-year-old son of a bankrupted Quaker attorney. Box was to become manager of the business when Sly died in 1826, and gained a reputation for fine shoemaking through its participation at international exhibitions and by obtaining Royal Warrants. The business became known as Joseph Box Ltd in 1862 after it was transferred to Robert's son, Joseph. Like his father, Joseph started in the trade at the age of 15, but retired at the relatively early age of 42 to enable his daughters to enter society. Although he transferred the business to his cousins the Box Kinghams in 1882, Joseph maintained an active interest in shoemaking through collecting. At the end of the century the business was later taken over by royal shoemakers Gundry & Sons, which was itself taken over by John Lobb Ltd some time after 1953.